If we tag our tattoos thoughtfully, everyone can filter tattoos they want to see. You do not need to use the #(hash/pound) symbol in TattooCloud Captions or tags. TattooCloud DOES NOT USE #'s - if you add them they are automatically removed. Type your keyword(s), then type a comma (,) or press enter to create the tag. You'll see it change to a green box when your tag is made. If you make a mistake, just press the backspace key to remove the previous tag or click the x on the tag itself. The first tag to consider should be what type of tattoo it is. ie: "color" or "black and grey" (or "fusion"). Next add appropriate tags to describe the entire tattoo and what's in it. It might be only one thing. ie: Portrait, Star, Flowers, Roses, Sword, Koi are good descriptors that people use to look at sets of tattoos with those things in them. Please tag thoughtfully with words that accurately describe the tattoo - and nothing else. This doesn't work and just makes you look like a spammer. Do NOT tag location info such as city, state or zip code. People will find you and your portfolio because of the accurate info you enter on your profile page. DO NOT tag your tattoos with "tat" "tattoo" or "tattoos" or "color tattoo" or "rose tattoo" etc. we already know it's a tattoo. Don't append the word tattoo to the keyword. ie: "celebrity tattoo" - wont be grouped in the collection "celebrity" where it should be. No need to tag them "original". This website is pretty much all original tattoos. Do NOT over tag. Non relevant tags will be removed by moderators and is considered spamming. Do NOT tag the clients name. That can go in the Caption. 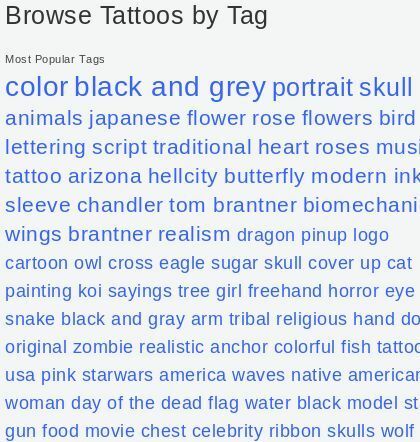 The better we all tag tattoos, the better searchability is for everyone. Please Tag Wisely - Thank you!